Although I've never reviewed a hotel before, this one warrants a mention. I recently stayed at the Fairmont Hotel near Millennium Park in Chicago. After booking my room, I was pleasantly surprised to find that the worldwide Fairmont Hotel chain strives to accommodate all guests' dietary preferences. This means that all Fairmont Hotels offer a Lifestyle Cuisine menu that includes options for macrobiotic, gluten-free, raw, and vegan diets. I was pleased to find these options not only in the in-room dining menu, but also in the restaurant in the hotel. Wow! It is very unusual to see this. What's funny is that the breakfast menu only lists one option for vegans -- couscous, while they also offer oatmeal on the regular menu, which can be made vegan as well. It is a little confusing. I decided to try both on different days. 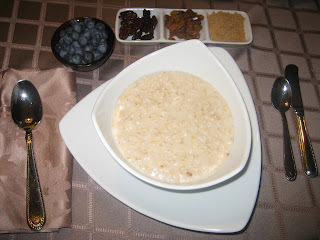 The oatmeal was made with steel cut oats and served with blueberries, brown sugar, yellow raisins, and walnuts. It was really good. They told me that they make two batches -- one made with water and another made with milk/cream so be sure to ask for the vegan version. The only negative thing I have to say is that they put cow's milk in a little container on the side of most breakfast dishes so mine was served with cow's milk. When I called down to ask why there was milk, the staff said they weren't aware that cow's milk shouldn't be served with the vegan dishes. They brought me up a container of soy milk instead. I was disappointed that they didn't know better, but happy to find that they stocked soy milk. On another day, I tried the couscous. I was intrigued because I had never thought of having couscous for breakfast. I found that I actually liked the couscous more than the oatmeal. It was served with toasted sliced almonds, dried papaya, and dried apples. Their all-day in-room dining menu, which I did not have the pleasure to order off of included salads, zucchini-wrapped eggplant, grilled portobello with crispy tofu and miso vinaigrette and vegan carrot cake. That's right - vegan carrot cake in a hotel. For lunch, I ate at the Aria restaurant located inside of the Fairmont. Little did I know that this restaurant's chef, Beverly Kim, was currently on Top Chef and is a pretty well-known chef specializing in pan-Asian cooking. You have to love this picture. The first day, they offered to make me a vegetable bibimbop sans the animal products. It was delightful. The next day, I ordered the vegan singapore, which was stir-fried vegetables, tomatoes, nuts, and bean sprouts. It was pretty good. The final day, I ordered vegetable maki rolls (not on the menu) and the market greens salad. I had been eating out every day and just wanted something light. The dressing really made this salad -- a light citrusy dressing. It was served with salty parsnip chips. I should also mention that they serve a bread with four chutneys as an amuse bouche at the Aria. The bread is typically brushed with butter, but they are happy to bring out a basket of bread that is not brushed with butter, and is, therefore, vegan. Three out of the four chutneys are vegan as well and incredibly flavorful. I looked forward to it every day! We also held a reception at the Fairmont (I was there for work) and they were very accommodating. Their Middle East station had many vegan items including eggplant and tomato dip, roasted garlic hummus, and other spreads along with assorted flatbreads. They even labeled each item that was vegan. I thought that was a nice touch. I also ordered passed hors d'oevres. One I ordered off of their menu, which was the vegetarian California roll. This one was pretty standard. 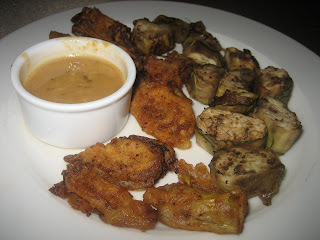 The other two were chef's creations -- eggplant boxes wrapped in zucchini and artichoke fritters with pine nut butter. The artichokes were my favorite. All in all, it was as good of an experience as I've ever had at a hotel. My highest hope in a hotel is usually just to find a salad on the menu that does not have meat on it. To offer vegan carrot cake and couscous with nuts and fruit takes this hotel chain up a notch and sets a new bar with which I hope other hotel chains will someday meet. In the future, I'll be seeking out the Fairmont hotels for my vacation destinations.